The Dominican. Latin community and lovers of Dominican culture turned “outside and inside” last evening to be part of this intimate gathering with the famous singer Milly Quezada who very pleasantly shared anecdotes about her life and her career with the audience in an auditorium filled to its capacity. 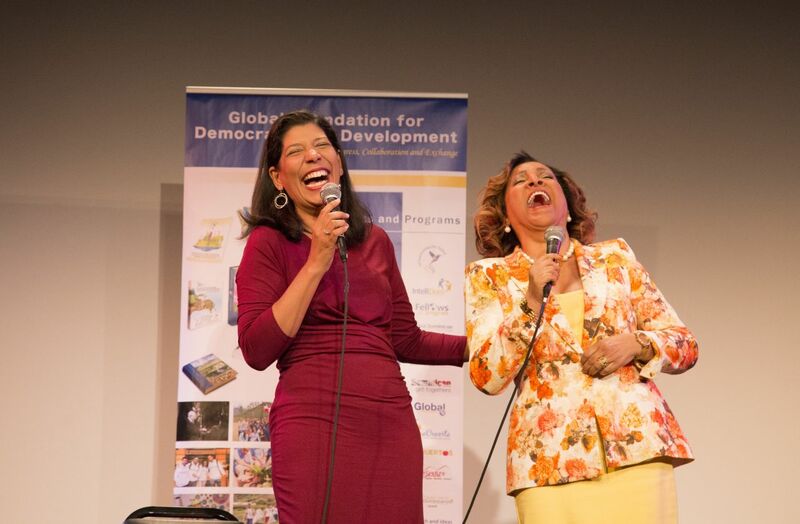 Global Foundation for Democracy and Development (GFDD) celebrated its second Dominican Get-Togethers of 2016 on April 21 at the Symphony Space Theater in New York City with the presence of the famous and beloved Dominican singer, Milly Quezada, “The Queen of Merengue”. The event initiated with the welcoming remarks of Yamile Eusebio, director of GFDD New York, who thanked the audience for their attendance on behalf of GFDD and its executive director, Natasha Despotovic. Eusebio then proceeded to present an institutional video that summarizes the work of GFDD across all platforms, followed by another short video highlighting the life, career and achievements of Milly Quezada. During this lovely “Get-Together” the audience had the opportunity to ask “The Queen of Merengue” questions, share anecdotes and express their respect and admiration for her talent and what she represents for the Dominican community and Dominican women in the United States. Some of the attendees reminded the artist about her humble beginnings, singing at churches and block parties in Washington Heights. Quezada expressed that the key to her success has been her commitment to maintain the quality of her work and her respect for the people that follow her and encouraged the new generation of artists to think in long terms and do their work with love and dignity. During the second part of the event Milly and Yamile Eusebio submitted the audience to a trivia session awarding the winning answers with GFDD/Funglode’s latest publication, “All Things Dominican” and the bestseller in the Dominican Republic “New Perspectives: Dominican Republic”. The artist also delighted the audience with 3 of her most famous songs: “Volvió Juanita” which she sang acapella with the audience; “Toma mi vida” which she sang in a duo with a fan and “Vive.” At the end of the night the public said goodbye to Milly with a standing applause and singing her songs. The artist expressed also to be very pleased by the event and thanked GFDD for creating the space for this type of activities that bring people together. Milly has won several awards throughout her long career such as Grammy, Billboard and Premios Lo Nuestro and has also received “the key to the city” from multiple cities within the United States and Latin America. She was honored by Hostos Community College with the Gold Medal Award, the highest distinction given by this institution and Milly has been the fourth person and second women to receive such a high recognition. She also received a Casandra to best actress for her role in the Dominican film “Juniol”. As a part of its mission to promote the understanding and appreciation of the Dominican culture, values and heritage, and to create opportunities for discussions of contemporary issues relevant to the Dominican society in the homeland and abroad, GFDD reaches out to the Dominican community living the New York Metro Area and to all those interested in the Dominican culture by organizing ongoing events: Dominican Get-togethers.